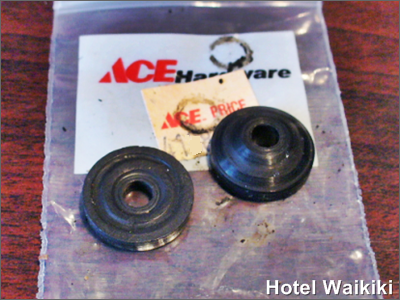 Just in case you're wondering, these items happen to be the rubber washers from the cold water valve in my bathroom shower. Drips. Still drips. You can see by the permanent indentions that I managed to embed into the rubber washers how tightly I turned the knob. Tried a cone-shaped washer too. Cranked that too with such enormous force that the plumbing pipes taped tapped the wrestling mat in submission but still to no avail. Alas, back to square one. Meaning I should never have started the five minute fix had I known all this in advance only to wax philosophically about a works in progress that's making no progress. It's five hour plus T-minus whatever and still have to run back to the hardware store for closure. Only to return home and have to listen to the vicious political ads that are on the tv. If some of these belligerent people who pass themselves off as politicians, pardon me, servants of the people, spent time fixing their water faucets, believe me, they wouldn't have time left over to run for political office much less spout all that kukai. I am led to believe that, we're back with the shower faucet, I would need to file the lip around the hole in the bronze water fixture, I'll have to ream the edges flat. That should seat the rubber washer more fully on the mating surface and stop the drip. However, I don't have the specialty tool to perform this arthroscopic surgery as outlined in the New England Journal of Plumbing. Just being humorous. I'd have to buy the vital plumbing gizmo brand new. Albeit, at all costs, what I'm trying to avoid is buying a new faucet assembly all together. It would amount to an easier fix doing things via that route, more expensive, but a civilized repair, if you know what I mean. The problem with this option even if money was not a factor, is that in order to replace the old bronze faucet valve, I'd have to desolder the copper pipes from that aged plumbing fixture with barely any elbow room to work inside the plumbing wall. There must be money in bronze fixtures at the rate thieves have been stealing the bronze water heads off sprinkling systems around Waikiki. Lolo (stoopid). The issue you are having is with the "seat" which is the bras part you are talking about filing down. If you look inside the seat and the opening is hexagonal or square then it is replacable. If so, then all you would need is the appropriate seat wrench and replacement seat. You can also grind the seat using the appropriate tool but that usually only has about a 20% success rate. Also, flat washers and coned washers aren't interchnagable. The face of the seat dictates which to use. Plumber in a former life. Just call A-1 BUDGET PLUMBING. They are in the yellow pages. I have used them for the past 3-4 years. Fast and reliable. We get leaks, too! Aggggravating!!! We bought Delta when we put it in during our renovation because the plumber told us we needed to get Delta. Sheesh! He must have been a secret Delta salesman, because it leaked 2 years later. Alan- I simply resorted to the cone shaped washer in desperation. The cone of uncertainty if ever. I never had this problem with sink faucets. Our building redid the pipes about 5-years back. The 40 years old faucets are still there. gigi- would still be too much. We're talking about soldering cooper pipes behind the plumbing wall. Kay- I would think it's not only the manufacturer but also the line of their brand. Economy class, etc. Delta is better than most, though. I have "ceramic valves" on my sink fixtures, and did away with any knobs. More sanitary with the lever. Good luck getting that leak fixed. Brad- I might just leave it alone for a while. It's down to a tiny drip, and perhaps a little research on the internet is in order.